What is the install process for a new home? 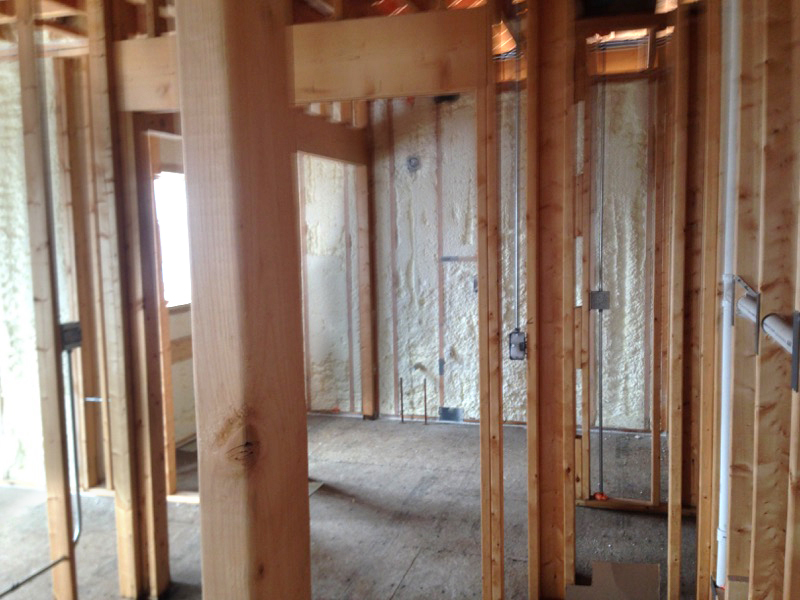 If you are a homeowner in the process of building a new home, or a new home builder working for a client, here is the new home insulating process you can expect when working with Indiana Spray Foam. A quote can be requested online or by calling our office at 888-936-3626. If the estimate is scheduled when your home is standing, we will review and measure your home, provide a written estimate, and answer any questions you may have. If you are still in the planning process, you can submit your prints to us for an estimate, or if it is not yet standing, you can get rough budgeting numbers using our new construction budgeting calculator. Either way, we would still need to review the structure in person to confirm the numbers and move forward. Once you decide to move forward, we will get you on the install schedule. The foreman will start by reviewing the scope of work with you and answering any questions you may have. Most homeowners and builders contract us to spray the entire house, while others want us only to spray certain areas. We offer two options for the attic, a closed attic assembly (where the roof deck is sprayed) and a complete air seal package (around can lights, baffles, soffit pockets, etc.) with blown-in cellulose. Both options can be discussed during the estimate. After completing the project, the foreman will review the job with you and get sign off. You will later receive a lifetime warranty in the mail from us after the paperwork is processed covering the product and workmanship. If you have any questions about insulating your home, business, pole barn or would like to schedule an estimate, please call our office at 888-936-3626.